Caroline Lawrence: "I ladri di Ostia"
Letteratura per l’infanzia. Narrativa per bambini. Roma, I secolo d.C.: Flavia, Gionatà, Lupo e Nubia sono quattro amici intraprendenti e coraggiosi. Ogni giorno, finite le lezioni di storia e matematica, non vedono l’ora di dedicarsi al loro passatempo preferito… andare a caccia dei misteri che si nascondono in città! Caroline Lawrence (born 1954) is an English American author, best known for The Roman Mysteries series of historical novels for children. 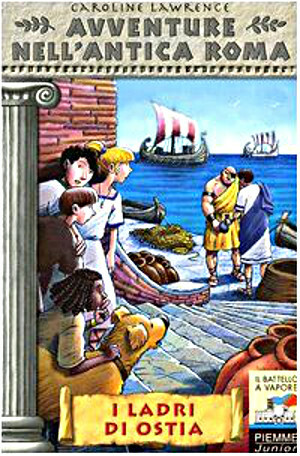 The series is about a Roman girl called Flavia and her three friends: Nubia (a freed slave girl), Jonathan (a shunned Jewish boy) and Lupus (a beggar boy without a tongue). The series has won numerous awards and has been published in many different languages worldwide.